Surfing magazines and websites gorge on images and videos from Namibia’s ‘Skeleton Coast’. Where the desert meets the sea, long winding waves unload onto barren sands, drawing waveriders from around the world. Thomas Traversa reflects on his journey to its shores. We always start by looking at the sea before venturing into it. It is its movement that defines it in our eyes, its undulations, the sound of its breathing, its colour, the rocks that it licks, the sand it swallows and spits out tirelessly. You just have to look at the surface of the sea to read the strength and direction of the wind, choose your sail and board before you jump into the water to do what makes you happy, navigate. The spectator leaves the apparent immobility of the earth’s ground to become an actor of a vast living spectacle. If the fire hypnotises, the sea attracts, scares, provokes and fascinates. Where the water meets the earth, its energy is concentrated in a last assault against the inert shore, a wave forms, and disappears. Followed by another one, then again a wave, so many ephemeral and unique expressions of the continuous agitation of the seas. There are places where the swell, when it is favourable, creates particular waves in the sense that we can ride them, tame them or challenge them; that is surfing. The shape and the regularity of the waves are what make these places become “spots”. The sea attracts, scares, provokes and fascinates. Skeleton Bay in Namibia is currently one of the most incredible spots in the world for surfers and wave enthusiasts in general. You only need to look at a photo or a video of these perfect and endless lines to understand that there is an almost supernatural phenomenon happening on this stretch of coast. For more than two kilometres, waves break only a few metres away from the beach, one after the other, with a regularity and perfection that no healthy mind would be able to imagine. Literally, a dream wave. I have never been able to tell if dreams were made to be realized, or not. Riding a wave at Skeleton Bay on a windsurf board is a dream that deserved some research on the internet. From photos and videos, observe the sea, detect signs of the wind, conclude that it seems feasible. Examine the details of the coast, examine the aerial views, cross-check the information, draw conclusions about the possible location of this mysterious wave. Then, wait for the right weather window, monitor the wind, the swell, their strength and their direction. Skeleton Bay in Namibia is currently one of the most incredible spots in the world for surfers and wave enthusiasts. 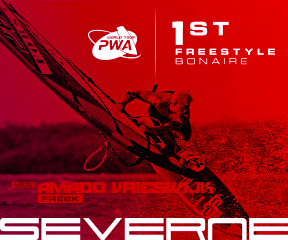 A motivated photographer, two assiduous cameramen and four riders excited to be the first ones to windsurf this wave. An opportunity that none of us would want to miss. After a couple of days the mission is planned, plane tickets are bought, vehicles and accommodation reserved. The die is cast. And yet we continue to doubt. A few days later we land in Windhoek, everything is dry around us, we can only see pebbles, a lot of sand, the shrubs are not even green. We drive west for half a day, surrounded by sand. Sometimes we go through a village… and then come the dunes, at the top of which the sand begins to fly. Finally, something that seems to move. Four riders excited to be the first ones to windsurf this wave. Four days in a row, the wind rose in the late morning to blow stronger than we had hoped. 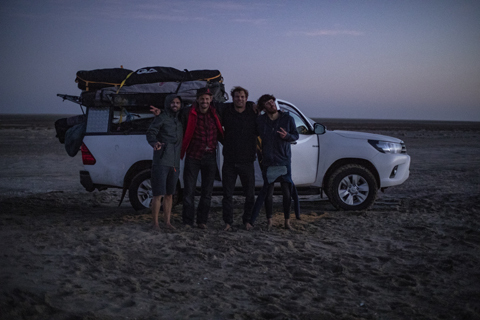 On the first day we made it to the spot and the swell, as we expected, was short of size; it was still very beautiful and we were able to ride some pretty little waves before sunset. The many locals did not seem bothered by our presence and continued to play a few metres from the beach: I had never been in the water with so many seals. On the second day, nothing had changed, the wind started to blow with all its strength, but no sign of the swell that we were waiting for. 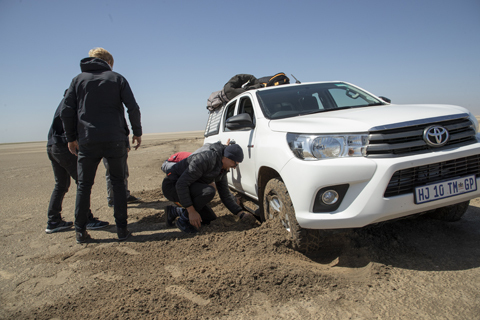 Everyone, without daring to say it, began to worry, so we prepared our equipment to throw some jumps downwind of the spot, for lack of better conditions. Seals followed us closely, I do not know if they were interested or annoyed, but it added some excitement to our synchronized jumps session. We then waited, alone at the edge of this desert where the sand was flying as if it was carried by a powerful river, finally pouring into the ocean before our eyes also filled with sand. We were witnessing in real time the formation, the uninterrupted modification of the coast, in a combined movement of sand and water. The swell never really arrived that day, Leon and Flo still returned to the water as the sun slowly went down to the horizon. Leon was in his fifth or sixth manoeuvre on the same wave when he crashed into a seal that had just jumped in his direction, mouth wide open. The seal was flattened by the sail which had crashed on the surface of the water. On the way back it was already dark and the wind had covered the tracks we had left in the sand, we did not really know where we were going, or if this trip was such a good idea. We did not really know where we were going, or if this trip was such a good idea. If you think about it, the most popular windsurf spots have several points in common: the regularity of wind conditions; a relative ease of access allowing the presence of a community of windsurfers, mix of locals and people from elsewhere; at least as many people on the beach as in the water. 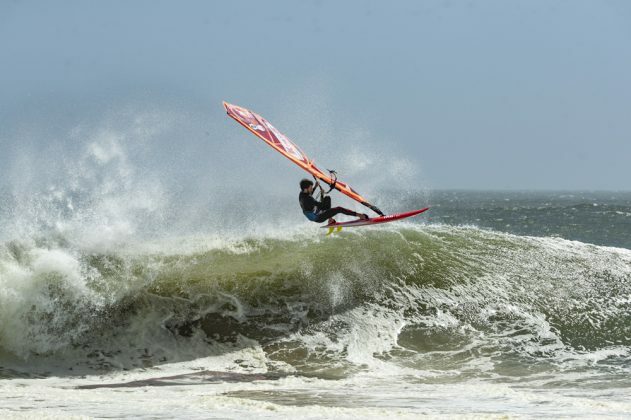 Whether on Ho’okipa’s hill, Pozo Izquierdo’s small cafes or Cape Town’s nightclubs, windsurfers usually enjoy and seek contact with other windsurfers after sessions. A bit like migratory birds, we gather according to the seasons in different parts of the planet, to which we like to return regularly to enjoy the good conditions in the company of the local windsurfing fauna, who are generally more sedentary and don’t have a choice but to share their little piece of paradise. At Skeleton Bay there is no windsurfers on the horizon, no trees in the shade of which to rest, neither parking nor lawn, nowhere to shelter; except the presence of seals and some jackals, no life nearby. At Skeleton Bay there is no windsurfers on the horizon. On the third day we arrive a little earlier and many vehicles are already at the edge of the beach. The waves are here! It is still too early for the wind to rise, but we have in front of us what we came for: the same perfect waves that we had seen in the videos. We immediately jump in with our surfboards and manage to catch some nice waves between the long walks on the beach that the powerful current imposes on us. The wind finally picks up and the waves keep getting bigger, so we drop our surfboards and quickly prepare our windsurfing equipment, overexcited by looking at these magical conditions that we had dreamed of. We stay in the water until sunset, sailing as much as possible because we know that it is now that it happens, tomorrow the swell may have disappeared. The waves are so long and so intense that we have to take short breaks regularly to regain strength. For some reason it is not that easy to ride the wave good but it doesn’t really matter. Perhaps for the first time in my life, facing these perfect lines unfolding as far as the eye can see, I take at least as much pleasure to contemplate the waves as to surf them. We are at the right place at the right time, the excitement has given way to calm, everyone lives the experience in his own way, including Pierre, Jamie and Julian who are on the beach to immortalise it all. The waves are so long and so intense that we have to take short breaks regularly to regain strength. On the fourth day we arrive on a beach again deserted, the swell has dropped but the vision is just beautiful. The perfect-looking head-high waves look so fun, the wind is a little lighter than the previous days, we all have a huge smile and eyes that shine: “that’s what windsurfer’s paradise must look like,” says Flo, summarizing more or less what we are all thinking. Once again, we sail until the night, Leon throws powerful turns and manages to ride a wave for 2 minutes and 45 seconds. Flo lands super clean goiters, Camille and I really enjoy the lighter winds. Pierre is in the water with us to take pictures, everyone is happy, the seals share some waves with us. The sand is flying gently on the beach, everything seems in balance – land, sea, seals, windsurfers, and a beautiful sunset to close the party. Everything seems in balance – land, sea, seals, windsurfers. The next day a thick mist has replaced the sand in the sky, the swell has continued its course to the north, we enjoy a day of well-deserved rest after all these emotions. Since the beginning of this trip I have been listening to an audio book in which the main character uses a term that caught my attention: the FOMO syndrome, standing for ‘Fear Of Missing Out’. This fear is particularly fuelled by some aspects of modern technology such as smartphones and social networks. I wonder if it’s a similar feeling that pushed us to come here. After seeing all the incredible images of Skeleton Bay on the internet we couldn’t not come. On top of that we were going to be the first windsurfers, so imagine the lure of that! At the lodge where we are staying, Leon has found a South African surf magazine that devotes a long article to this unique wave: its discovery, its functioning, its past, but also its future, everything is explained, except its exact location of course, which has never been publicly revealed. We discover with astonishment that a group of Namibian diamond divers used to ride the wave on their windsurfers back in the 1980s. And to think we believed were the first ones … the wave was however very different at that time, it peeled for ‘only’ about a hundred metres. Satellite imagery shows that the coast has changed dramatically in the last 40 years as wind, sand and ocean currents have worked together to create this unique stretch of coast that we call Skeleton Bay. Some people think that at this rate, the spot as we know it, could disappear in the next five years. It’s up to you to find it by then. After seeing all the incredible images of Skeleton Bay on the internet we couldn’t not come.